How do you go paperless when you live in multiple locations and have to deal with paperless bill and tax issues? Awesome DocumentSnap reader Allan wrote with his paperless setup, and I thought it would be helpful to share with the DocumentSnap community. You might not be a dual citizen and have deal with international issues, but we can all pick up some tips. Moving overseas, and being a US ex-pat, and a new Israeli citizen was in fact my motivation for finishing my paperless office project. Starting maybe a year before the move, I was seriously going through all the boxes in my garage, all the filing cabinets, and either discarding, or scanning and shredding everything. Even though I was current on getting all my current bills and financial documents into PDF form, I had quite a backlog. 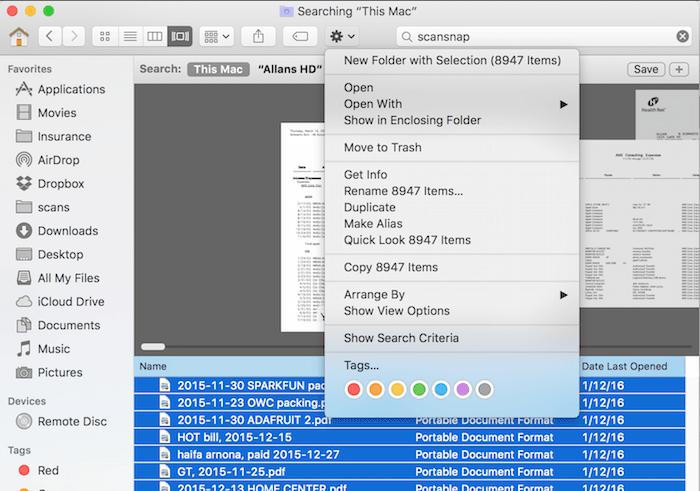 I have scanned thousands of documents with my ScanSnap, and filed them carefully. At that point, mostly in 2011–2012, I scanned approximated 7500 documents. I remember taking a dozen boxes to a commercial shredding service — I was scanning (or in some case just discarding) more paper than I could shred. By the way, its really cheap to use a shredding service. Eventually, I moved to my new location with almost no paper (just my original identity papers), and a laptop full of past life. Now I maintain two households: one in California, one in Haifa Israel. All utilities, all credit card bills are on “AutoPay”. I think I pay manually about 1, or occasionally 2 bills per month. I use the FileThis service to download and file my utility bills in dropbox. Great service. FileThis, in conjuction with automatic payment reduces my monthly work to nothing (just for those bills). I use a postal mailbox service called travelingmailbox.com, who scans all of my snail mail. Next, having stopped mail delivery at my California residence, I get absolutely zero junk mail and no additional documents to scan from my US mail. I have a todo list listing all my monthly financial todos — it structures my bill paying or organizing workload. This makes me more time-efficient, and more relaxed that I didn’t forget something. Without having the paper reminders, it is easy to forget to pay a bill, or collect statements or something. This todo list is very detailed, including, “scan & shed every loose document” and “do 3rd backup of Macs” (the first being Dropbox, the second being Time Machine). Paperwork flow had to be modified to work for the Israeli tax system. I’m a self-employed software engineer. First of all, I’m a US Citizen, a “US Person” according to the IRS, meaning I have to pay US taxes against all worldwide income and contribute to Social Security. However, I’m also an Israeli citizen, and I have to pay Israeli taxes against all income earned in Israel. Plus bill and pay VAT for all my billed consultant income. Also, I pay “b’tuach leumi” which is the Israeli social security. The paperwork burdens are completely different. Example: say I buy a new computer desk at IKEA. on my American Express bill, and make sure this amount ends up somewhere on my Schedule C.
I am not obligated to keep the original receipt, nor even the American Express bill, just my summary accounting (and scans). Note from Brooks: Consult a tax expert in your area to see what you have to keep. It could be very different. The Israel system is different. I can not only deduct the amount on my Israeli taxes, I can also immediately reclaim the VAT paid at IKEA, and my next bi-monthly filing. But to do that, you must ask for a special “Receipt for Tax purposes” (Heshbonit Mas), which is separate from the regular cash register receipt. And you must keep all the paperwork together (like the delivery receipt, and the payment for delivery, and the two receipts). I must provide my accountant all paper receipts, and in fact only original receipts are allowed. Because the increased paperwork burden, and the multiple filings you must make, and the separate checks you must write for Taxes, VAT, and social security, most self-employed consultants I know meet with their accountant every 60 days. So, from this requirement, I have now designed an efficient paperwork flow. I incur a deductible expense, I immediately take the receipt (or print the receipt in some cases) and place in a special set of folders “FOR ACCOUNTANT”. The night before I see the accountant, I organize, itemize, and scan and file every document I am going to give to my accountant. Then, those papers are held by the accounting firm. (So the paper is out of my house). All other pieces of paper are therefore not related to taxes. I can then discard or in some cases, scan and discard. Dealing with this comprehensively every 60 days is easier, I think, and less stressful than the single filing we do for the US taxes. Now, I seem to do about 500 scans a year, usually doing them on Friday morning, so only about 10 scans a week. I download a lot of statements (banking, utilities, etc…), but I work on it only a few hours every Friday, and about 4 hours once a month, plus another 2 hours before seeing my accountant, bi-monthly. So I think I’ve got a good system. Thanks Allan! I like how you have a routine set up, which makes things a lot easier and makes it more likely to stay on top of things. If you have questions for Allan, leave a comment and I will try to get it answered for you. You seem like you have organized your particular issues enormously well. I actually am an accountant in Israel (Tel Aviv), and I like Allan’s approach to the paperless issue. I would just note for his information that the Israeli tax authorities are becoming more and more aware or the importance of going paperless, and Israeli law does therefore allow to retain documents for tax purposes (such as invoices and receipts) issued in digital form (PDF), providing such documents are digitally signed by an independent third-party service like VeriSign etc. More and more businesses in Israel are shifting to issuing such digitally-signed documents, which needless to say streamlines the billing and accounting process and substantially reduces costs. Many of my clients just e-mail me such documents instead of printing and sending me a hard copy, and that works great for all parties concerned.